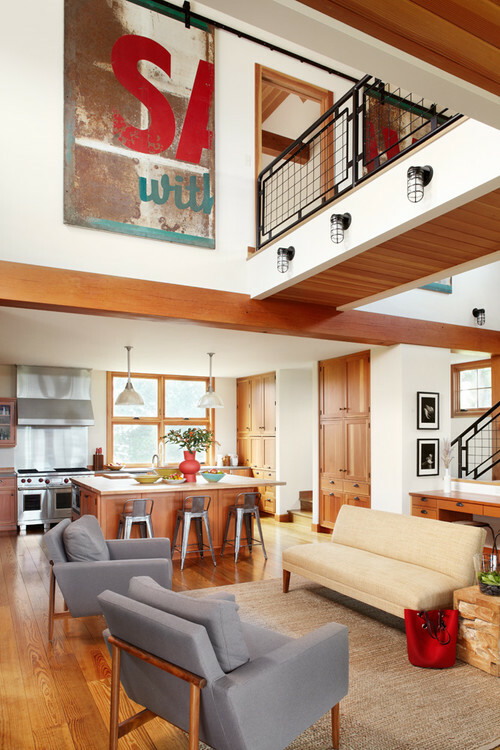 When it came to designing a contemporary second home for a Chicago-area family, architect Bill Bickford looked to an old barn on their 200-acre working farm in Wisconsin. The farm has been in the family for more than 25 years, and they had forged a strong connection to the property. “When you look out to the surroundings, you see beautiful old oaks, barns and silos dotting the landscape,” he says. Bickford designed a home that’s both contemporary and technologically advanced, and also fits the rural context and the family’s desire for wide-open spaces, family gatherings and relaxing weekends. Who lives here: This is a second home of a family with young children. The old barn, near the top of one of the rolling hills, was in a bad state of disrepair; they had it carefully disassembled in a way that they could reuse the materials in the future. Bickford, of Northworks Architects and Planners, sited the new house just above where the old barn had stood, incorporating the remains of its limestone foundation walls around the pool. Meanwhile, the family made plans to use as much of the old structure as possible for future projects and in some of their furniture. Siting the home atop a hill just above where the former barn stood means it enjoys spectacular views across the bucolic landscape. Because of the north-facing orientation, the house gets great natural light, without the solar heat gain from direct southern sunlight in the summer. The proportions of the new house are very similar to that of the old barn. The footprint, including the large north-facing porch shown here, is roughly 75 feet long and 26 feet wide. The materials emulate those of barns in the surrounding countryside, with red cedar siding and a tin-coated copper roof that will develop a patina over time. The old barn’s original limestone foundation walls form a terrace between the pool and the house. The pool surround is ipe, a durable and low-maintenance wood. The doors lead to a garage built into the hillside and with a garden on top. The outbuildings in the distance are original to the property; you can see some of the crops growing in the distance. The inside of the house connects to the outdoors in ways beyond the views. For example, the large hearth is crafted from local limestone, as was the original barn’s foundation. The hearth is two-sided; the other side serves the large front porch. Doors on either side slide into pockets hidden by the fireplace surround, inviting in the summer breezes. The rhythm of the trusses is the same from indoors to out, but they change from Douglas fir inside to steel outside. “The clients wanted this home to be as close to no maintenance as possible,” Bickford says. The steel, red cedar siding and metal roof require little maintenance and last a long time. The site has a natural slope, but Bickford cleverly designed the lower level to be above-grade on all sides. “There is more ventilation this way; the lower level can be fully opened and aired out,” he says. It also meant he could tuck unsightly items like utility meters out of view underneath. The lower level contains two guest suites and a large bunk room; guests who come out to the farm usually stay overnight. The bridge leads to a recessed ground-level entryway that in turn leads into the dining area. The doors on the right lead to the bridge. 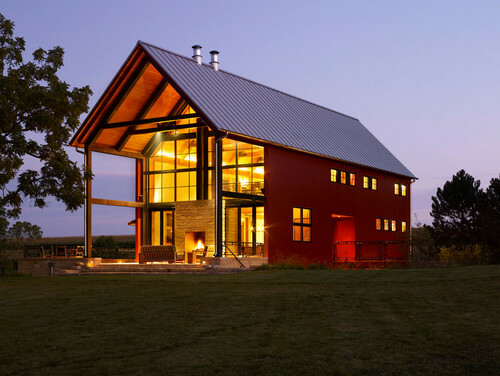 The barn structure lends itself to a wide-open floor plan, perfect for large gatherings and enjoying the views. The floors throughout are heart pine, salvaged from river-bottom trees. “It’s a dream to work with clients who have furnishings that make your work look even better,” Bickford says. The homeowners saved what they could from the original barn for furniture projects, including the dining table, which a friend made for them. The homeowner made the light fixture himself from metal pipes. Wood and metal mix throughout the inside of the house, as on the rest of the farm. In the kitchen a large sheet of stainless steel provides a backsplash behind the range. Simple Tolix stools provide perches for plenty of folks to gather around the large island. The large island’s top is butcher block; both the owners are big cooks and enjoy spending time in the kitchen. The rest of the countertops are highly compressed recycled paper. Two large ceiling fans provide plenty of cool air. The home is powered by a field of solar panels just southwest of the house. The panels generate energy to power the home and pool equipment and send leftover power back to the grid. The construction is timber frame with structural integrated panels (SIPs) at the roof. The original barn’s rustic purlin and rafter roof construction inspired the structural system, but the new trusses have a cleaner, contemporary look. The wood for the ceilings, soffits and trim is Douglas fir with a clear coat. The homeowners found the large sign at a salvage place (look closely at the upper-right corner of this photograph and you’ll see the other half). They sign halves silde along barn door tracks and serve not only as art but also as doors between the bridge and the master suite. One of the home’s most contemporary elements is the staircase, but it still nods to the agricultural architectural vocabulary. The stairs are laminated wood and cantilever off a bracket bolted through to a timber stringer beam. 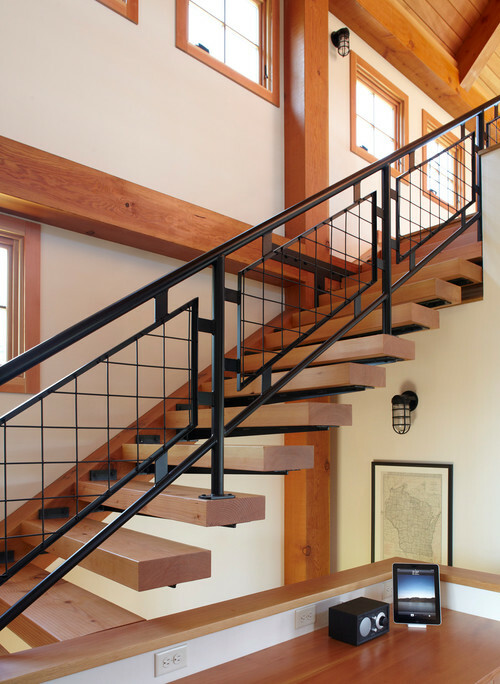 The metal railing brings back the traditional farm feeling; its grids were inspired by the kind of fencing one might see around a pig pen.